Carbonaceous chondrite (CV3.3,ox; S3; W0). After detonations and a fireball, a single 3 kg stone fell on 15 April 1857. Kaba is a member of the oxidized subgroup of Vigarano-like Carbonaceous Chondrites. Carbonaceous Chondrites are classified primarily on the basis of their bulk chemistry (especially, their Mg/Si ratios) and their oxygen isotope ratios. In spite of its moderate mass and the long period since recovery, Kaba has been well-curated and has been utilized in recent research focusing especially on Calcium-and-Aluminium rich inclusions (CAIs. These inclusion are quite similar to those found in the more renown and massive Allende (1969 fall), another member of the CV3 oxidized subgroup. There are, however, some interesting differences among this subgroup which also includes Bali, Grosnaja, and Mokoia. Reference: Brearley, A. J. & Jones, R. H. (1998). Chondritic Meteorites. In: Planetary Materials (Papike, J. J., Editor): Chapter 3, 398 pages. Mineralogical Society of America: Washington, DC, USA. (1998) ; Kimura, M., & Ikeda, Y. (1998). Hydrous and anhydrous alterations of chondrules in Kaba and Mokoia CV chondrites. Meteoritics & Planetary Science, 33(5), 1139-1146. Reference: Kimura, M., & Ikeda, Y. (1998). Hydrous and anhydrous alterations of chondrules in Kaba and Mokoia CV chondrites. Meteoritics & Planetary Science, 33(5), 1139-1146. Reference: Brearley, A. J. & Jones, R. H. (1998). Chondritic Meteorites. In: Planetary Materials (Papike, J. J., Editor): Chapter 3, 398 pages. Mineralogical Society of America: Washington, DC, USA. (1998) ; Kimura, M., & Ikeda, Y. (1998). Hydrous and anhydrous alterations of chondrules in Kaba and Mokoia CV chondrites. Meteoritics & Planetary Science, 33(5), 1139-1146.; Grady, M. M., Pratesi, G. & Moggi Cecchi, V. (2015) Atlas of Meteorites. Cambridge University Press: Cambridge, United Kingdom. 373 pages. Reference: Kimura, M. & Ikeda, Y. (1998). Hydrous and anhydrous alterations of chondrules in Kaba and Mokoia CV chondrites. Meteoritics & Planetary Science 33 (5): 955–1198. (Sept 1998). ; Kimura, M., & Ikeda, Y. (1998). Hydrous and anhydrous alterations of chondrules in Kaba and Mokoia CV chondrites. Meteoritics & Planetary Science, 33(5), 1139-1146.; Grady, M. M., Pratesi, G. & Moggi Cecchi, V. (2015) Atlas of Meteorites. Cambridge University Press: Cambridge, United Kingdom. 373 pages. Reference: Brearley, A. J. & Jones, R. H. (1998). Chondritic Meteorites. In: Planetary Materials (Papike, J. J., Editor): Chapter 3, 398 pages. Mineralogical Society of America: Washington, DC, USA. (1998) ; CHOI, B. G., Krot, A. N., & Wasson, J. T. (2000). Oxygen isotopes in magnetite and fayalite in CV chondrites Kaba and Mokoia. Meteoritics & Planetary Science, 35(6), 1239-1248.; Kimura, M., & Ikeda, Y. (1998). Hydrous and anhydrous alterations of chondrules in Kaba and Mokoia CV chondrites. Meteoritics & Planetary Science, 33(5), 1139-1146. Description: Olivine found in POP,PO,and BO [minor] chondrules. Reference: Mason, B. H. (1963). Carbonaceous Chondrites. 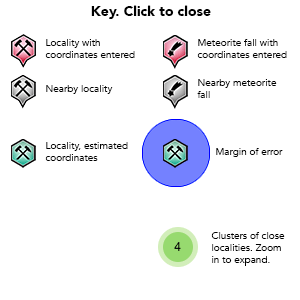 Space Science Reviews 1, 621-646.; Grady, M. M., Pratesi, G. & Moggi Cecchi, V. (2015) Atlas of Meteorites. Cambridge University Press: Cambridge, United Kingdom. 373 pages. Reference: Grady, M. M., Pratesi, G. & Moggi Cecchi, V. (2015) Atlas of Meteorites. Cambridge University Press: Cambridge, United Kingdom. 373 pages. Reference: Ramdohr, P. (1973). The Opaque Minerals in Meteorites. Elsevier Publishing Company. Amsterdam, London, New York. ; Kimura, M., & Ikeda, Y. (1998). Hydrous and anhydrous alterations of chondrules in Kaba and Mokoia CV chondrites. Meteoritics & Planetary Science, 33(5), 1139-1146. Reference: Ramdohr, P. (1973). The Opaque Minerals in Meteorites. Elsevier Publishing Company. Amsterdam, London, New York. ; CHOI, B. G., Krot, A. N., & Wasson, J. T. (2000). Oxygen isotopes in magnetite and fayalite in CV chondrites Kaba and Mokoia. Meteoritics & Planetary Science, 35(6), 1239-1248.; Kimura, M., & Ikeda, Y. (1998). Hydrous and anhydrous alterations of chondrules in Kaba and Mokoia CV chondrites. Meteoritics & Planetary Science, 33(5), 1139-1146.; Grady, M. M., Pratesi, G. & Moggi Cecchi, V. (2015) Atlas of Meteorites. Cambridge University Press: Cambridge, United Kingdom. 373 pages. Description: Pentlandite more abundant than troilite. Reference: szakáll & gatter, 1993; Kimura, M., & Ikeda, Y. (1998). Hydrous and anhydrous alterations of chondrules in Kaba and Mokoia CV chondrites. Meteoritics & Planetary Science, 33(5), 1139-1146.; Grady, M. M., Pratesi, G. & Moggi Cecchi, V. (2015) Atlas of Meteorites. Cambridge University Press: Cambridge, United Kingdom. 373 pages. Reference: Brearley, A. J. & Jones, R. H. (1998). Chondritic Meteorites. In: Planetary Materials (Papike, J. J., Editor): Chapter 3, 398 pages. Mineralogical Society of America: Washington, DC, USA. (1998) ; Grady, M. M., Pratesi, G. & Moggi Cecchi, V. (2015) Atlas of Meteorites. Cambridge University Press: Cambridge, United Kingdom. 373 pages. Description: Pyroxene bearing chondrules include porphyritic pyroxene (PP), porphyritic olivine pyroxene (POP), and radial pyroxene chondrules. Reference: Mason, B. H. (1963). Carbonaceous Chondrites. Space Science Reviews 1, 621-646.; Kimura, M., & Ikeda, Y. (1998). Hydrous and anhydrous alterations of chondrules in Kaba and Mokoia CV chondrites. Meteoritics & Planetary Science, 33(5), 1139-1146.; Grady, M. M., Pratesi, G. & Moggi Cecchi, V. (2015) Atlas of Meteorites. Cambridge University Press: Cambridge, United Kingdom. 373 pages. Reference: Szakáll& Gatter: Hun. Min. Spec., 1993 ; Kimura, M., & Ikeda, Y. (1998). Hydrous and anhydrous alterations of chondrules in Kaba and Mokoia CV chondrites. Meteoritics & Planetary Science, 33(5), 1139-1146. Reference: Szakáll& Gatter: Hun. Min. Spec., 1993 ; Kimura, M., & Ikeda, Y. (1998). Hydrous and anhydrous alterations of chondrules in Kaba and Mokoia CV chondrites. Meteoritics & Planetary Science, 33(5), 1139-1146.; Grady, M. M., Pratesi, G. & Moggi Cecchi, V. (2015) Atlas of Meteorites. Cambridge University Press: Cambridge, United Kingdom. 373 pages. Mason, B. H. (1963). Carbonaceous Chondrites. Space Science Reviews 1, 621-646. Ramdohr, P. (1973). The Opaque Minerals in Meteorites. Elsevier Publishing Company. Amsterdam, London, New York. Kimura, M. & Ikeda, Y. (1998): Hydrous and anhydrous alterations of chondrules in Kaba and Mokoia CV chondrites. Meteoritics & Planetary Science 33 (5): 955–1198. (Sept 1998). Brearley, A. J. & Jones, R. H. (1998). Chondritic Meteorites. In: Planetary Materials (Papike, J. J., Editor): Chapter 3, 398 pages. Mineralogical Society of America: Washington, DC, USA. (1998). Grady, M. M. (2000). Catalogue of Meteorites (5/e). Cambridge University Press: Cambridge. Brenker, F. E., Krot, A. N., Palme, H. & Keil, K. (2001). ATEM Study of Ca, Fe-rich Pyroxenes in Matrices of the CV Chondrites Allende, Kaba, and Efremovka. Meteoritics & Planetary Science 36 (9-Supplement): p. A29. (Sept 2001). Nagashima, K., Krot, A. N., Huss, G. R. & Hua, X. (2007). Common Presence of 16O-rich Melilite in Calcium-Aluminum-rich Inclusions from the Least Metamorphosed CV Carbonaceous Chondrite Kaba. Lunar and Planetary Science XXXVIII: LPI Contribution No. 1338, p. 2059. (March 2007). Grady, M. M., Pratesi, G. & Moggi Cecchi, V. (2015) Atlas of Meteorites. Cambridge University Press: Cambridge, United Kingdom. 373 pages.